NEW ORLEANS – It’s week four of the NCAA Division I Indoor Track & Field National Team Computer Rankings, so that means it’s out with the preseason times and marks from the formula and in with the 2015-only rankings. Gone with those preseason times/marks? Both last week’s top-ranked men’s and women’s teams. The Florida men reclaimed their preseason No. 1 position from defending indoor/outdoor national champion Oregon, and the Arkansas women ended Georgia‘s short-lived reign at the top with their first No. 1 rank in the eight-year history of the rankings, which were announced Monday by the U.S. Track & Field and Cross Country Coaches Association (USTFCCCA). Oregon’s defending champion men dropped to No. 2, followed by the stationary duo of No. 3 Arkansas and No. 4 Texas A&M and a four-spot improvement by Texas to round out the top five. Last week’s women’s No. 1 Georgia slid down to No. 2, just ahead of No. 3 Florida (also down a spot). No. 4 Texas, last year’s national runner-up, made a two spot improvement over the weekend, bypassing five-time defending national champion Oregon at No. 5. With the rankings now based solely on 2015 performances (excluding the combined events), Florida’s and Arkansas’ current campaigns have shone through brighter than anyone’s in the country. The Gators have ten competitors ranked among the nation’s top-eight performers in their events (a.k.a eight athletes score at NCAAs), while Arkansas has 12 – both more than any other team in the country. The Gators have two top-ranked athletes and four more ranked No. 2, while Arkansas has a No. 1 and five more in the top three. See the full breakdown of top-10 performers by school here. Behind big weekends from collegiate-leading triple jumper Marquis Dendy and the 800-meter duo of No. 2 Andres Arroyo and No. 6 Ryan Schnulle, the Gators improved their team rankings score by 12 points to 190.51, more than 36 ahead of Oregon. That total still has room for growth, as well. Defending 200 meters outdoor champion/indoor runner-up Dedric Dukes is just No. 14 in his signature event after one outing, and two-time 2014 indoor individual All-American Arman Hall hasn’t yet competed in an open event. No. 2 Oregon is another team with some room for growth depending on who runs what at the NCAA Championships March 13-14 in Fayetteville, Arkansas. Returning The Bowerman Trophy finalist Edward Cheserek is currently No. 2 in the mile and No. 5 at 3000 meters, but that double is not one currently allowed in the rankings formula. He’s said that he’ll likely run the mile and 3000 at NCAAs, as well as the DMR, so that is a significant wild card in this projection. The Ducks are distance-heavy with nine individual performers ranked top-10 in the mile, 3000 and or 5000, plus the No. 7 DMR. Eric Jenkins is currently No. 1 both at 3000 and 5000 meters. Arkansas got a pair of top-six 3000-meter performances from No. 3 Kemoy Campbell and No. 6 Stanley Kebenei to remain at 128 points in the rankings, just enough to hold off No. 4 Texas A&M with 126.08 after a 24-point improvement. While quarter-mile studs Deon Lendore – the reigning winner of The Bowerman Trophy – and Bralon Taplin checked in at No. 2 and 3 for the Aggies after season-bests at the Tyson Invitational, it was third-ranked triple jumper Latario Collie that boosted A&M the most. In-state rival No. 5 Texas jumped four spots into the top five behind the No. 6 4×400 relay, a No. 6 performance at 5000 meters from Craig Lutz and No. 8 long jumper Basil Fares. It’s the Longhorns’ highest rank since checking in at No. 3 in the 2013 preseason. Rounding out the men’s top 10 were No. 6 LSU, No. 7 Georgia (up one spot), No. 8 Penn State (down three), No. 9 Oklahoma State (up eight) and No. 10 Virginia Tech (up two). The Cowboys made the biggest jump into the top 10 behind No. 8 3000-meter runner Fabian Clarkson and No. 9 miler Chad Noelle. It’s been since week five of the 2013 season when OSU was ranked No. 6 the Cowboys last appeared so high in the top 25. Elsewhere in the rankings, No. 16 Kansas State made a nice 13-spot improvement, but the biggest moves came from the bottom of the top 25. No. 23 Illinois jumped 26 spots, while No. 24 South Carolina moved up 34 and No. 25 Washington climbed 35. Falling hard in the opposite direction were No. 38 Stanford (down 28) and No. 36 Villanova (down 25), which were No. 10 and 11 before this week’s shuffle. No team benefited more greatly from the removal of preseason marks and times from the rankings formula than did the Arkansas women. Dominique Scott ran 8:52.57 at Washington for the fifth-fastest all-conditions time in collegiate history, but she was already ranked No. 4 in the event with preseason data. Rather, the biggest contributors to the Razorbacks’ ascent to No. 1 were No. 2 400-meter sprinter Taylor Ellis-Watson, No. 9 5000-meter runner Diane Robison and top-10 jumper Tamara Myers. The highest rank for the Razorbacks prior to Monday had been two consecutive No. 2 showings to end the 2012 regular season. They ultimately finished fifth at the NCAA Championships. While the men’s program in Fayetteville is legendary, the Arkansas women’s program has yet to break through for its first national title. The Razorbacks’ highest finish was a third-place effort in 2000. That surge put Arkansas with 207.52 team rankings points well ahead of No. 2 Georgia at 163.56. Outside of Carly Hamilton’s No. 8 mile from a year ago coming off the board, the Bulldogs broke even after with the removal of preseason marks. Sophomore superstar Kendell Williams accounts for 63 of those points, down just slightly from 70 a week ago. Down a spot to No. 3 with 159.97 – right on Georgia’s tail – Florida was mostly impacted by Taylor Burke‘s drop from No. 3 to No. 17 in the high jump. The senior is a couple inches shy of her mark from a year ago, but it’s worth noting she did make her 2014-best at the SEC Championships near the end of the season. 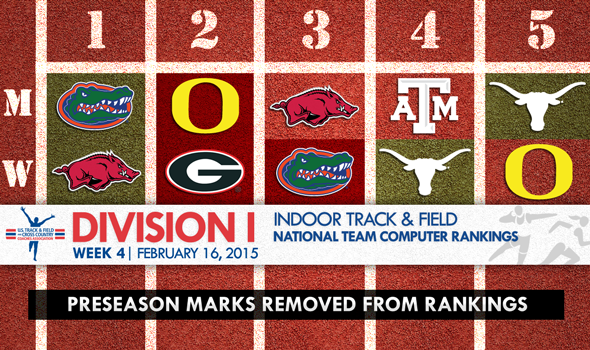 The Gators got 11 season’s bests this weekend that impacted the rankings, including No. 1 efforts from Kyra Jefferson at 200 meters and Bridgette Owens in the 60-meter hurdles. Texas boosted by the No. 2 60-meter hurdles time from Morgan Snow, along with the No. 8 performance at 5000 meters from Sandie Raines. Defending champion Oregon stayed put at No. 5 with 127.34, losing the slightest bit of ground despite the No. 2 200m and No. 5 60m performances by Jenna Prandini. No. 7 shot putter Brittany Mann helped to keep the Ducks afloat in the rankings, as well. Rounding out the top 10 were No. 6 Kansas State (up four spots), defending national outdoor champion No. 7 Texas A&M (down three), No. 8 Kentucky (down one), No. 9 Baylor (up 18) and No. 10 Wisconsin (up eight). K-State is at an all-time program-best for the fifth time this season (two weeks at No. 12) with its first-ever single-digit rank for either gender’s indoor program. Leading the way is budding all-around star Akela Jones. The Oklahoma Baptist transfer is the collegiate leader in the long jump and accounts for 63 of the Wildcats’ 113.44 points – identical to Georgia’s Williams. Baylor is in the top 10 for just the second time in program history, dating back to a No. 7 mark in the early days of the poll in week two of the 2008 season. Driving the improvement was No. 2 800-meter runner Olicia Williams. Wisconsin’s women joined the top 10 for the first time in program history behind thrower Kelsey Card, who moved up to No. 4 in both the weight throw and shot put. No. 13 Southern Illinois followed U.S. Junior shot put record holder and collegiate leader Raven Saunders to its highest rank since the end of the 2012 season with a 12-spot improvement. The other big moves of the week came from No. 18 LSU (up 18 spots) and No. 24 Washington (up 31). Teams that fell hard? No. 20 Providence and No. 12 Georgetown dropped 12 and 10 spots, respectively.